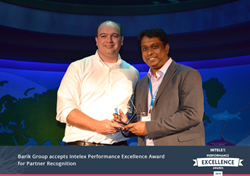 Barik IT Solutions, a longtime Intelex partner received the Ignite Performance Excellence Partnership Recognition Award. The award is given to the partner that exemplifies an outstanding commitment to Intelex both in terms of consistently collaborating with and advocating for Intelex. Barik IT Solutions represent IT Division of Barik Group specializing in Health, Safety, Environment and Quality (HSEQ) software sales, and implementation and support services. With Offices in Oman, UAE, and Saudi Arabia, Barik IT Solutions provides a local Middle East presence for Intelex conducting software sales, support and implementation services across the region. With HSE IT expertise and solid understanding of HSE regulations and standards, Barik IT Solutions has facilitated rapid growth for Intelex within the Middle East region. Their quick implementation, service plans and support have been the key to delivering many successful rollouts of Intelex solutions in this region. "It is our pleasure to be presenting Barik IT Solutions with this year’s Ignite Performance Excellence Award for Partner Recognition," said Cory Gendron, SVP, Market Strategy at Intelex "Barik IT Solutions is a long-time partner of Intelex. Their hard work and evangelizing of Intelex throughout the Middle East has earned them the title of most successful Intelex reseller," added Gendron. "This year they brought on the 50th client in the region and we look forward to welcoming many more. Thank you to the Barik team for your commitment, professionalism and continued collaboration with Intelex." Through its partnership with Barik, Intelex has experienced considerable growth in the Middle East over the past year. The company has been able to add several key industry players to their client portfolio. Barik IT Solutions is IT Division of Barik Group with head office in Muscat, Oman, driving innovative HSE solutions to help organization to increase their business growth via automating their processes. It started its operations in 2009 with head office in Muscat and now has offices in Abu Dhabi - UAE, and Al Khobar, Jeddah in Saudi Arabia. Barik have all the HSE and technical expertise to help Corporates in building and delivering HSE & Quality solutions for automating all their Business requirements. They have served major customers in various sectors like Electricity/Power, Oil & Gas, Construction, Metal, Aviation, Ports, Government and Service Industry. With more than 1,000 clients and one million users, Intelex Technologies Inc. is a global leader in Environmental, Health, Safety (EHS) and Quality management software. Since 1992 its scalable, web-based platform and applications have helped clients across all industries improve business performance, mitigate organization-wide risk, and ensure sustained compliance with internationally accepted standards (e.g. ISO 9001, ISO 14001 and OHSAS 18001) and regulatory requirements. Intelex is one of Canada’s most highly awarded and fastest-growing tech companies and has been named one of Canada’s Most Admired Corporate Culture, Best Managed Companies in Canada, one of the fastest growing companies by PROFIT Magazine, as well as one of the country’s top employers by Aon Hewitt and Best Small and Medium Employers.